I’m not Bakerella (Queen of the Cake Pops), but I whipped up some cake pops at my daughter’s request for her birthday. 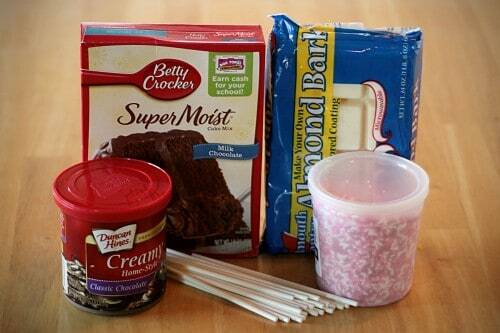 Easy ingredients – a cake mix (and what you need to make the cake), a can of frosting, chocolate, sprinkles and sticks. 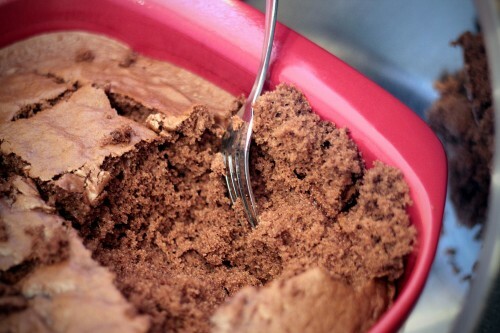 Make up your cake mix and bake. And now into a bowl. I know some people use a food processor, but this was easy enough, and less clean up than the food processor would have been. Now to add the frosting. 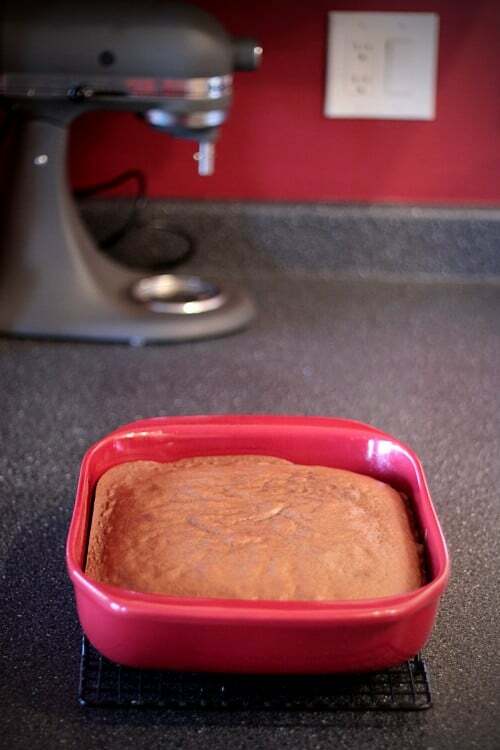 I am not a fan of canned frosting, so it was a bit painful for me to add it, but hey, it certainly qualifies as easy. I used about half the can. After combining the cake and frosting it formed a ball of dough so to speak. I think some people chill the dough, but since my little one was napping I had to take advantage of the time and went straight in to creating the cake pop balls. The next step was to put the sticks in. 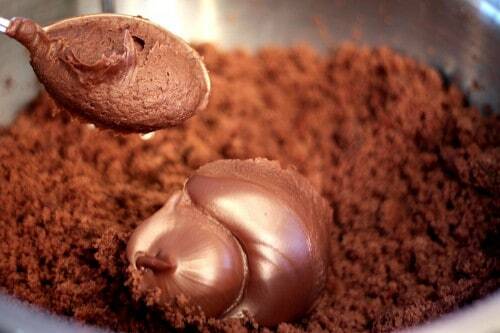 I prefer to dip the stick into a bit of melted chocolate, than into the cake pop. This seems to help the pop stay on the stick better, which helps a lot when you are dipping them in the chocolate. I made pink, white and chocolate covered cake pops. I started with the pink. I’m trying to get all of the pink I can in for Valentine’s Day. After putting the sticks into the cake pops, I stuck them in the fridge for a few hours. 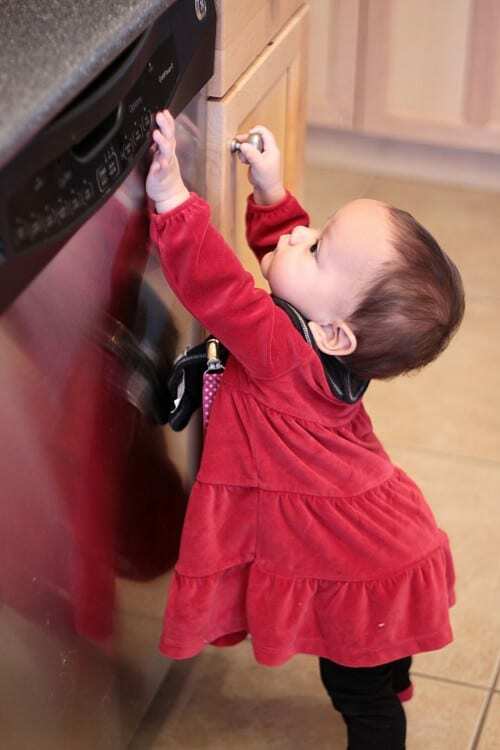 During that time I taught Grace how to use the dishwasher. A mom can dream, right? A few more shots of cake pop goodness. I didn’t have the time to try any of Bakerella’s cute cake pop decorating ideas, it was more a sprinkle and go type of thing. 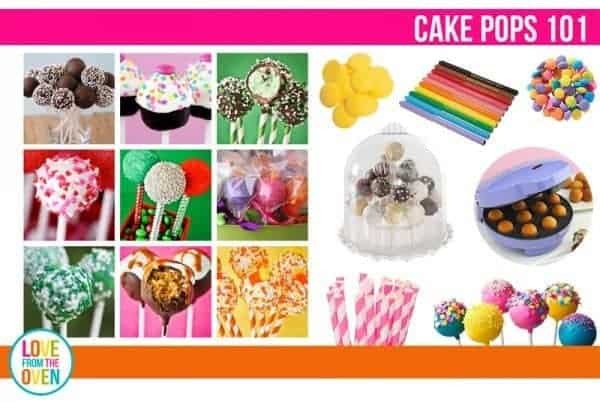 Also check out my Cake Pops 101 Guide for more info, as well as my favorite tools and supplies that help make making cake pops a little easier. *Update – since I wrote this post, I’ve made quite a few other cake pops as well. Click here to see all my cake pop posts! My daughter insisted on blue and green decorations for hers. Unfortunately she told me this after my trip to the baking supply store. Thankfully I had some blue and green sugars, though not as brightly colored as I would have liked. I didn’t plan to put these on a styrofoam stand, so I let them sit, cake pop down, to try. To keep with the last minute theme, my daughter requested on her way to school that I put them on a stand. This isn’t the most inspired, but I had to whip something up at home while Grace was napping. Eh, not that pretty, but it held up the cake pops, so it was functional. So while they weren’t the cutest, the girls at my daughter’s dance studio seemed to enjoy them, so mission accomplished. wow lovely cake pops!! you have truely inspired me to do some.. lovley pics! I think your stand is quite pretty. And I LOVE the blue and green sugar! This idea is brilliant! Making these seem easy, affordable, and DELICIOUS! So cute! This will be on my list of things to put in my care packages. Happy Birthday to ur daughter! 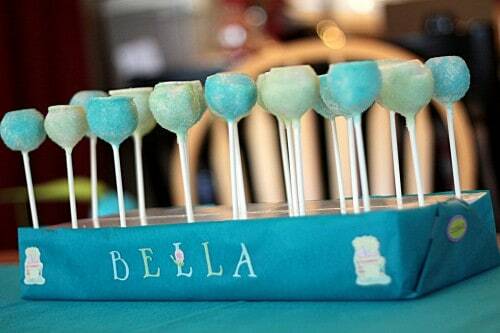 She must be so lucky to have a mom who would make beautiful cake pops on her birthday! and what pretty cake pops they are! I hope it’s alright if i put your photos on my blog, it’s all about food and i find all your recipes amazing! i credit you in every post, and i send them to your website. if you have any problems with me doing so, please reply. thank you so much, i love your blog! Chloe, absolutely! Thank you for the kind words, and I’m more than happy to let you use them. I hope other people can benefit from my recipes and just seeing that some of these things are really simple to put together. 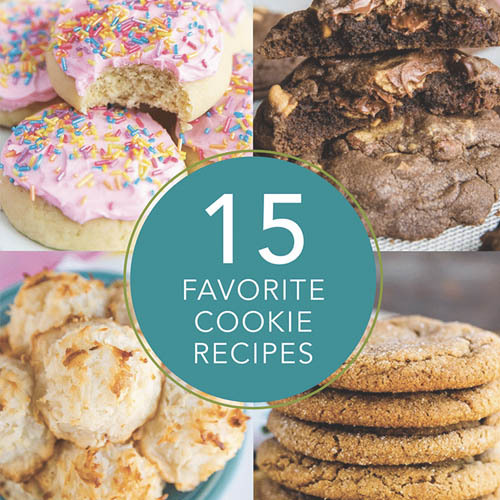 I think so many recipes can sound pretty intimidating, and one of my goals with my blog is to show that you can quite easily (and inexpensively) create some really fun baked goods and treats. Love this idea….Thanks so much for the recipe! Did you have pink candy melts or did you color the vanilla almond bark?? I just LOVE the pink.. so I was wondering about that. How many does one box of cake mix make? This is really great! This is actually the easiest recipe I have found online. We noticed a lot of bakery cafe’s coming up with these, and we (Well, I, ha) wanted to make these for my stepson’s 10th birthday. 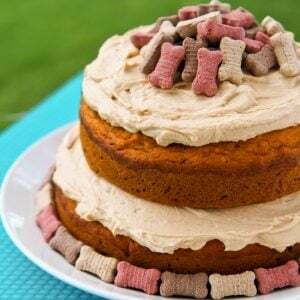 They’re the perfect grab-and-go cake treat for a bunch of rowdy boys who don’t want to be bothered with having to sit down and eat a plate of cake. I also think these would be a great snack to make to send back home to my family, as they look like they’d ship well, packed with a bunch of shipping peanuts 🙂 You did a fantastic job! I hope it’s as easy for me as it was for you. You’re awesome! Thanks, I’m making these for a school project right now. Christi, thanks for the great and easy recipe. I have a leftover chocolate sheet cake that cracked and I hated tossing it out so I thought I’d try my hand at making some cake pops. I also have a lot of colored melting chocolate and various sprinkles. I decorate cakes so I already had some of the stuff on hand. I’m going to make them tomorrow for my grandkids and see what they think. I’ll let you know how it all turns out. And your pictures were delightful. Thank you again. This does seem easy!! Its summer break and im going to attempt them!!! Thanks for the tips!!! Thanks for such an easy explanation/recipe. So sorry to see someone like this dumb Emily post something so foul and nasty. I hope she isn’t a mom. When I made these they were very hard to coat with the chocolate..it went on way too thick. Did you thin the chocolate out somehow? You are the bomb!!!!! My kids are in gymnatics and cheer!! They need a gift for thier sponsors….this is perfect, inexpensive, and toooooo cute. Attempted on my own and they were ok but certainly not as cute or tasty!!! Thanks so much for sharing…..
omg that is super cute man mine came out ugly!!!!!! We had our first granddaughter graduate from 8th grade and her mother bought the cake pop molds and we had so much fun making lots of them and the people loved them. Thanks for sharing the recipes . I just made some cake pops and the cake part came out great, but the melting chocolate is too thick and when I dip the cake into the chocolate to coat it, but the cake fell apart. Any ideas on how to make this work? Thanks! One option is adding paramount crystals to the chocolate. Did you heat the chocolate enough to get it as liquified as possible? What chocolate are you using? 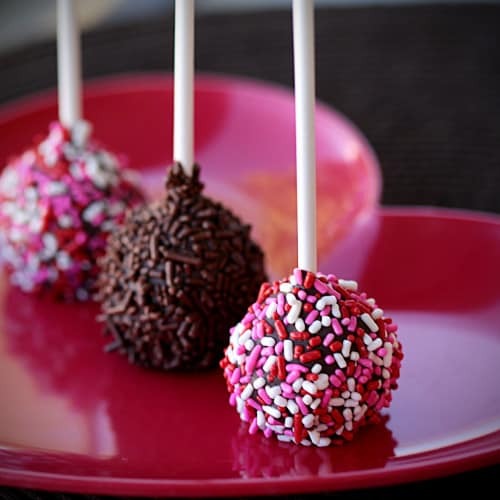 Are you freezing the cake pops before putting in the chocolate (and then dipping right out of the freezer?). I am going to try to make about 50 of these this weekend. About how many do you get out of one cake mix? Also do you freeze them at all before you dip them in the chocolate? Finally about how long do these last? I would like to make them couple days early. Thank you so much for the WONDERFUL instructions!!! Hi Mindy – I have to say this style of cake pop is by far my least favorite to make – but yes, freeze them for sure. How many you get depends on how large you make them – I would think two cake mixes would do 50+. You might want to check out the ones I do with the Babycakes maker (my favorite way) and with Oreos (which I think taste better than cake, and are a bit easier for me to work with). If you were unable to find something to hold them in, a good old fashioned toilet paper roll held the pops until the sprinkles set. Thanks for the EASY how-to recipe on how to make cake pops!! There are so many tricks for displaying cake pops these days. 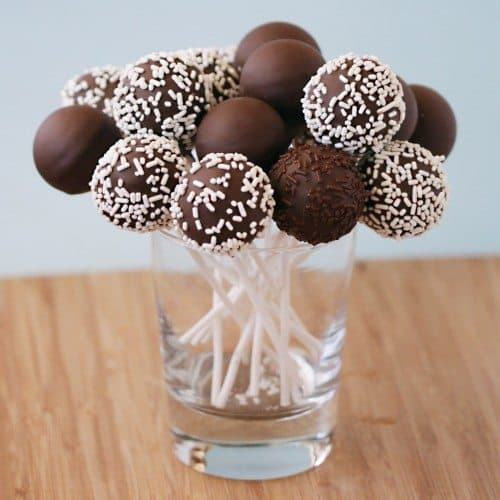 I love how some people are putting them into cake pop bouquets. Totally what I was looking for !! Thanks for the tips ! Very cute! Loved the step by step directions. I’m a working mom of 3 girls so I am always looking for something cute to do with them! Thank you so much for your pictures, and I think the stand is pretty awesome:) Thank you for sharing. Great Pictures! Soo helpful! Thank you! 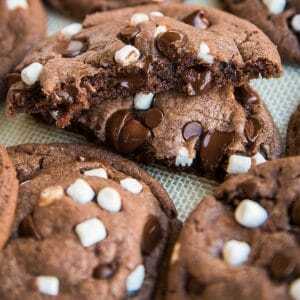 Im going to try to make these and the oreo recipe tomorrow. Its my step brothers bday on sat and I promised my mom I would bake cup cakes which im getting better and making my own frosting (I still have to master royal icing but almost there with my home made butter cream frosting) anyway! 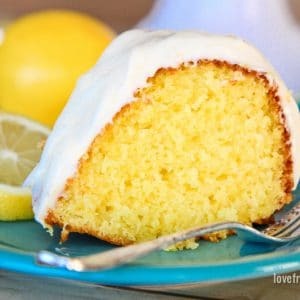 I have been wanting to make these for A LONG time for my 5 year old daughter and I had saved and read bakearellas recipe and have been way too scared to try it out but reading your recipes here give me hope! I bought all of the ingridients and even a pop cake stand and im hoping they came out as well and pretty as yours did. I have to admit, im mostly scared of the melting the chocolate and decorating part. I also really wish I could find some colored chocolate to melt, like blue and pinks and colors like that. also not to sound ignorant but what do you use the almond stuff in the picture for? I read the recipe several times and couldnt find reference to it but im very tired so may have missed it. any tips would me GREATLY appreciated! I need all of the help I can get! I can make great candy apples as well but im very scared of the cake pops! lol your picturs and recipes are great! Hi Katherine, Do you have a Michaels or Hobby Lobby near you? Both of those stores have colored melting chocolate. As far as the almond bark goes, there are instructions on the package – I don’t give directions because every brand is a bit different – I use a variety of brands, usually whatever is at the store I find myself in when I need some. Don’t be scared of the cake pops – give them a go, the chocolate really isn’t that bad – just remember it’s better to heat too low/little and add to versus overheat. 🙂 And I haven’t mastered royal icing either, I love a good simple buttercream – not fancy but so delish! Ok! I am making them right this second and reading the instructions on this page! i got everything except the almond bark! I hope its ok and they come out ok. I dont have much time! also should i freeze the cake balls before dipping them into the melted candy melts? I just took my two cakes out and im so happy because they actually came out pretty good!!! iim moving on to the oreo cake batter while the cakes cool! if you see this post soon, please let me know if i should freeze or not? thank you so much for replying and helping me with this! o and I also went out to bed bath and beyond and bought the baby cakes but I figured ill start with this first….trying baby cakes in a bit. 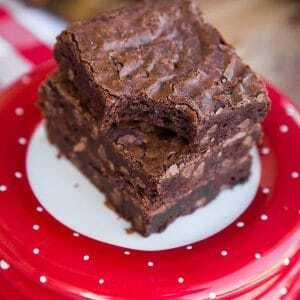 im trying to make these now..my batter came out a little gooey..dont know if i used too much frosting but i used half of the can.. i bought the same almond vanilla bark as you used in ur recipe but it seems to be too thick when i dip it. any tips on how to make the dip a little thicker?? also, does the bark need to be cooled when dipping or warm?? About how many cake pops does one package make? I love this idea, thanks for sharing. I’m going to do these for my daughters sweet 16…trying lots of different flavors including her favorite, orange cream! Thank you so much for sharing. I want to make these with a Christmas theme. It all sounds easy enough, but did I miss the part about the icing that you dip them into when finished??? Not sure what to do there. Saw the almond bark in the first pic …. guessing that’s what you use … but not sure what to do. At any rate – you have inspired me!!! Thanks. 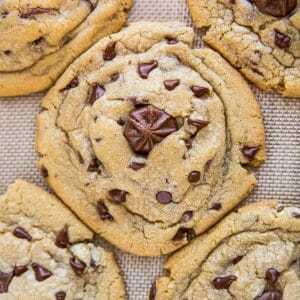 These are wonderful, the directions sound so easy and I can not wait to make these. My neice had made cake pops that looked like lil frog heads for her son’s b-day party and they were a big hit. She had tried to explain how easy these were to make but I thought, no way, lol.So i did a lil searching and found your facebook page and you was so kind and quick to respond when I asked the question on how cake pops were made. Thank you. I just ruined a cake and now need to make cake pops. I LOVE this idea but don’t have the time to dip them. Any ideas? Hey, the cake stand was wicked! The pops look stunning! Can you think of anything else besides frosting to help bind the cake balls? I can’t stand how sweet the frosting is – i thought about canned custard but that might be too runny…ideas? I’ve found that if you use super moist cake mixes (particularly Duncan Hines) you might not need so much frosting (if any at all). I love cake pops!!!!! making turkey ones right now!!!!! Cake Pops are so much fun to bake and more so to eat as you can tell from the expressions on the kids faces that they love these treats. hi this really helped so much! thanks! quick question, how many cake pops were you able to make with one cake? Im having a movie night with a lovely family and I saw your cake ball recipe I just had to make it thanks so much from my kitchen to yours. What a treat to find your blog!! Not only you give me inspiration to go for the adorable cake pops..you make it look simple..adorable and to top it off you have adorable girls and one of them is named Bella like mine! I JUST LOVE YOUR SITE!THE CUTEST IDEAS…AND DAUGHTERS.I HAVE 2 YEAR-OLD AND A 7 YEAR-OLD DAUGHTERS. Thanks for the pics and tips on the cake pops! I want to make them for my twins’ 5th b-day party, but figured it wasn’t as easy as some people made it look. Reading about them on your blog and trying to learn how, ahead of time is going to save me some heartache if I’d tried to wait until the last moment to ‘throw them together’! Christi, I enjoyed reading and learning about how cake pops are made. My daughter, Katie, inspired me to go on line to see how she makes them, and I came up on your site. I am putting together a baby shower for my daughter, and we are going to make them for the party. Katie made a batch of three different cakes mix flavors for Christmas, had them decorated so nicely, and we all enjoyed them. Thank you for inspiring others to do this as well. It is so pretty, so tasty, and even my son-in-law gobbled them down! WHY in this WORLD am I so far behind on the cake pop craze??? How stinking adorable?!?! My daughter has a valentines day birthday, so I showed her these and told her we were SO making these for her birthday, to which she replied, “No thanks!” Hmmm. Guess she’s a little behind, too! =) Thanks for making it look so easy! I am super pumped! 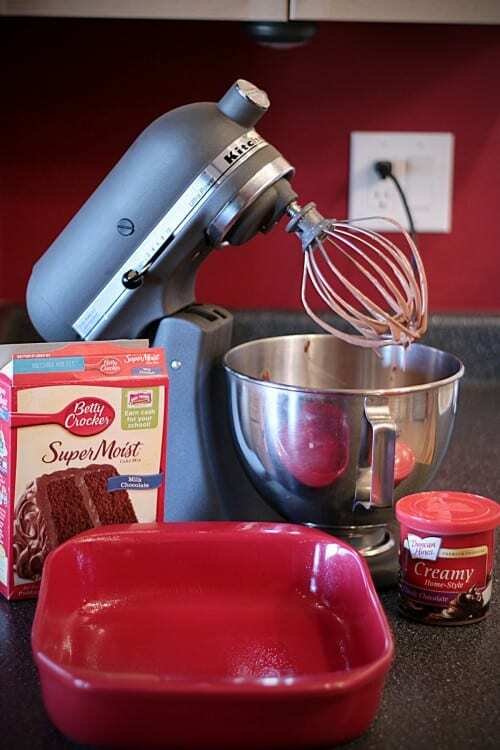 Can i make my own frosting to add into the cake mix instead of using can frosting? I can’t find them in my local DIY shop. Please advice. Thank you. Oop sorry I think u already gave the answer 2 my question on how many. Sorry I missed that the first time thru. Looks like approx 50 cakepops with 2 boxes of mix. Thx again. I think these are super cute! I’m going to make some for Valentine’s Day. You have inspired me. 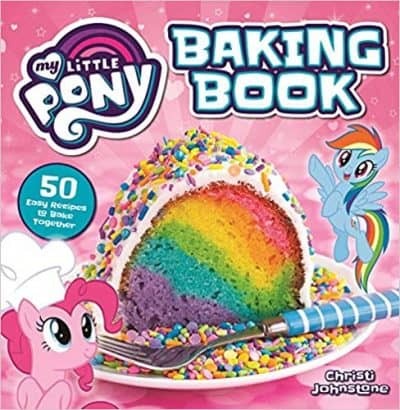 Just curious why you would use box cake mix and canned frosting? All the pictures are nice but do you have a from scratch version? Especially with the Kitchenaid being a serious mixer. when u don’t use the pan their flat on the bottom. Nicely done! 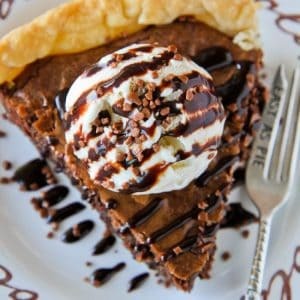 Im going to bake this tonight since its so affordable and easy to make. Thank you for the tips ya! Just finished up making these and wrapping them up for valentine’s day. Ran along a few bumps in the road, but for my first cake pop attempt I think they turned out okay. I used some leftover chocolate cake, so I didn’t have a full batch. So I think I might have put in too much frosting and not enough cake, because it ended up being super duper soft. I put them into balls, and dipped the sticks in the melted candy melt pellet thingies that we got. But even after chilling those overnight and all during the school day, they were still soft and didn’t stay of the sticks well. So my advice to anyone else new to cake pops, try not to go frosting overboard. Even though it may be very tempting. I couldn’t find any colored chocolate (I wanted pink chocolate for valentines day) at Michele’s, but I did find these “candy melt” pellets. They’re ment to be poured into molds and you heat them right in the microwave. When they cool they’re like a hard candy shell. Sounds great, but that had issues too. It was too heavy for my fragile soft dough, and when I tried to dip one it would all fall apart. So I ended up dipping only the bottom, quickly setting them on a cookie sheet, and used a spoon to carefully cover the rest of the pop, followed by a quick sprinkle shower. So, needless to say, they are very messy looking, not so nice and neat as yours. But in the end, they taste great. And the coating, however messy, hardened and really helped to stabilize it and hold it together. I just made them and they taste great. I couldn’t find any lolipop sticks so I just used skewers. the problem is they couldn’t stand still, the skewers gone though them. plz tell me how to make them stand still like yours… thanks for the great recipe in advance. did you add lard to the melted chocolate? I saw on You Tube someone had done that; not sure why? Maybe to make them shine? Hey ladiesss and mickie! Me and my bestest friends are making pops right now! Thanks for all the input! Its greatly appreciated! Bless y’alls cayute little hearts! This may sound like a stupid question but do you roll on your sprinkles right after you dip them in chocolate? And if you don’t want the flat on a side do you let the m cool a minute and them stick them in a stand or a piece of styrofoam? I love the cake pops at Starbucks.. now I’m going to have to make my own! I love them, though the texture was chalky. Thanks anyways!!!! love it! thanks for the great recipe! This seems to be a lovely idea. You have truly inspired me. Just a thought that crossed my mind. Where would get the sticks from if you don’t have any Baking supply stores near you at all? these instructions were not that good and my cake pops turned out gross. the stick didn’t even stay in the ball and i threw them out. DISAPPOINTMENT. 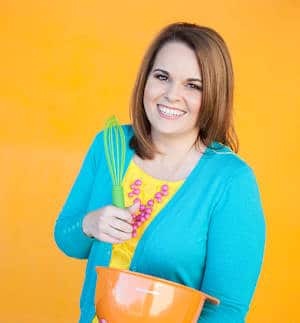 Michelle, maybe you will find something more to your liking over at Bakerella’s site… http://www.bakerella.com/category/pops-bites/cake-pops/ Since she pretty much started the cake pop trend, and is the author of a book on the subject, her advice is top notch and I can’t think of a greater expert when it comes to cake pops, hopefully you will not be disappointed with her site. Sorry yours were “gross” – given that every cake & frosting brand/mix/flavor/combo are different, everyone needs to find the flavors that are to their liking. I have a lot of cake pop advice, tips and tricks that can be found here if you are interested. Cake pops can certainly be a challenge. Best of luck! looks pretty good..i wanna try it..
What stinks is that when I found white chocolate chunks to use in my cake pops I couldn’t melt them. I tried 3 times and failed all three. I have made my cake pops and stuck them in the fridge but now they’re ready to be dipped in chocolate and I’ve wasted the whole pack of chocolate chips already. 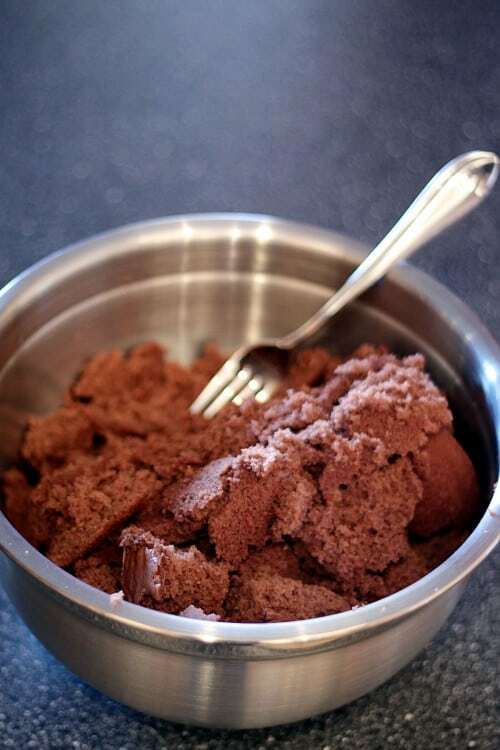 I was wondering how you made your melted chocolate and if its ok to leave cake pops in the freezer over night. 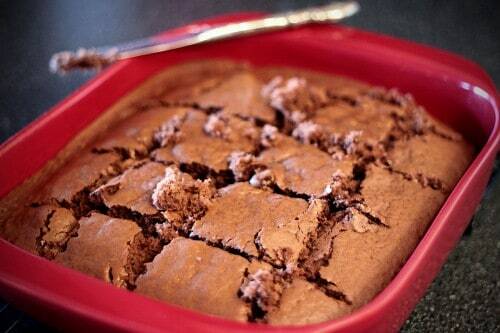 By the way I love your recipe and your pictures. 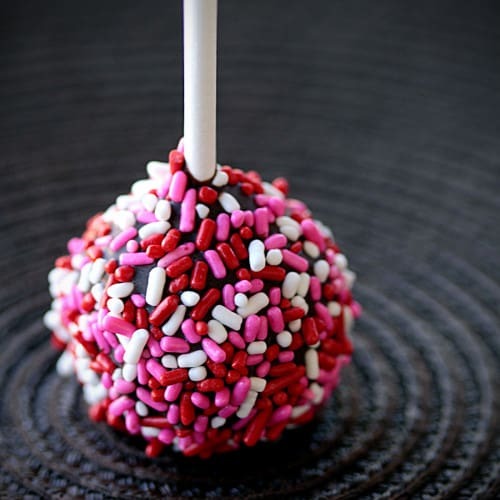 Brooklyn, here is my best advice for cake pops… https://www.lovefromtheoven.com/2012/02/15/how-to-make-cakepops-tips-tricks-advice-links-resources/ and for melting chocolate… https://www.lovefromtheoven.com/2012/01/14/melting-chocolate-to-make-cake-pops-chocolate-pretzels-chocolate-covered-marshmallows-and-more/ Hope they can help! 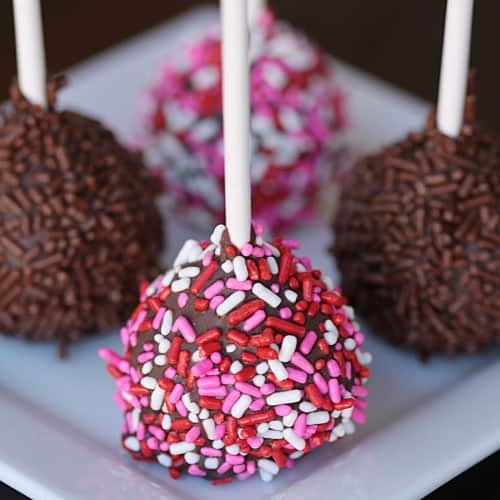 I love cake pops but have never tasted or made cakepops but they look interesting so i am looking into recepies!!!!!!!!!!!! Hey christi, mine turned out, well lets be honest, bad. They just weren’t doughy enough. They were completely falling off the sticks. We followed your instruction to a tee, so wondering any tips or ideas? Thanks….. These look delicious! I made some cake pops, but i decided to use more cake to make them bigger! And then to top it off, I also used a Pretzel stick instead of a lollipop stick as the handle! Your photography is amazing! I also like the comment of using a pretzel for a stick (no trash!) like PopsyCakes! How do you take such great pictures? Jacqui, yes, it will alter the taste a bit. I’d probably go with a vanilla. For a true yellow cake flavor, I think a baked cakepop (I use the Babycakes Cake Pop Maker) would be the way to go. I’ll actually be doing some posts on it here soon! thanks for sharing…we have a fund raiser at the residential home where i work…and these will go down a treat with the residents,staff and visitors. 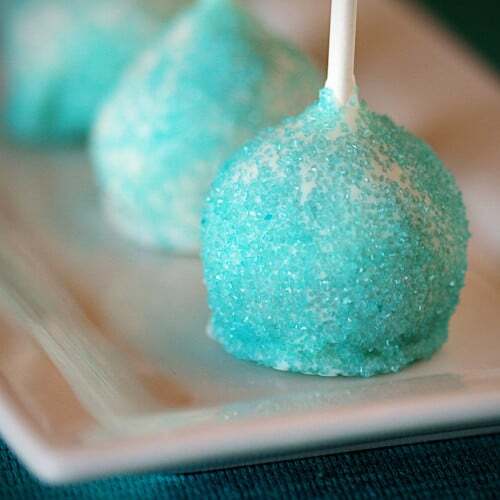 To see how to make cake pops are cool! but now i know how to make make them i’m going to make 30 cake pops with my best friends! but i hope they taste good! I THINK I’LL TRY THE RECIPE. Hi, i was wondering if you could give me the quantities for making appox. 24, dont worry if not, thanks! The pictures just make me want to eat a cake pop. Thank you for the great explanation of this recipe. 🙂 I am going to practice making these as I plan on adding them to the treat table at my son’s graduation party. Melanie – the frosting goes in with the cake after it’s baked, as shown in the photos. 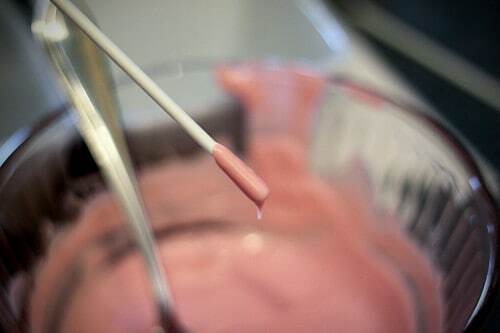 Almond bark is a form of chocolate coating (like Wilton Melts), that’s what you dip your cake pops in after you have mixed together your baked cake and frosting. 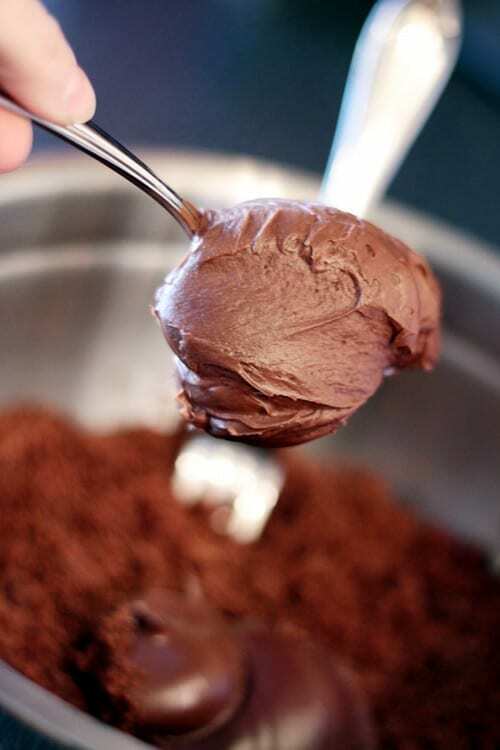 You do not dip them into frosting. You could, but it won’t harden or work like chocolate coating will. 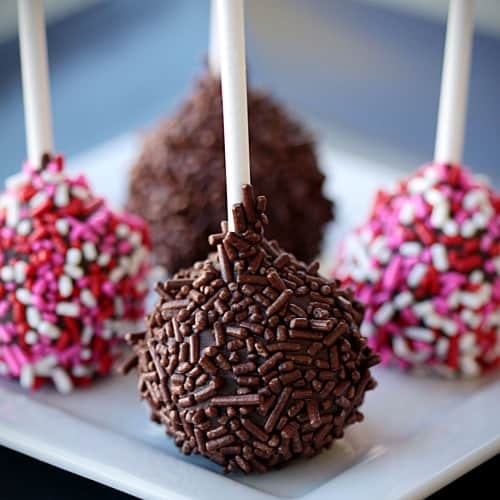 Any cake pops you see on my blog have been dipped in a chocolate coating or almond bark. Fun to read and great pictures. 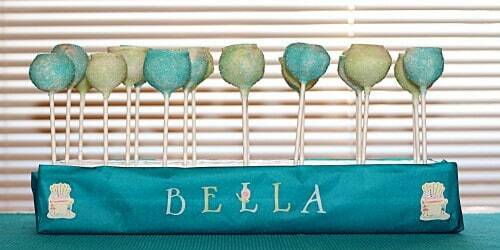 Thanks for the complete bakerella cake pop lesson! I have a feeling you would run into issues with that. 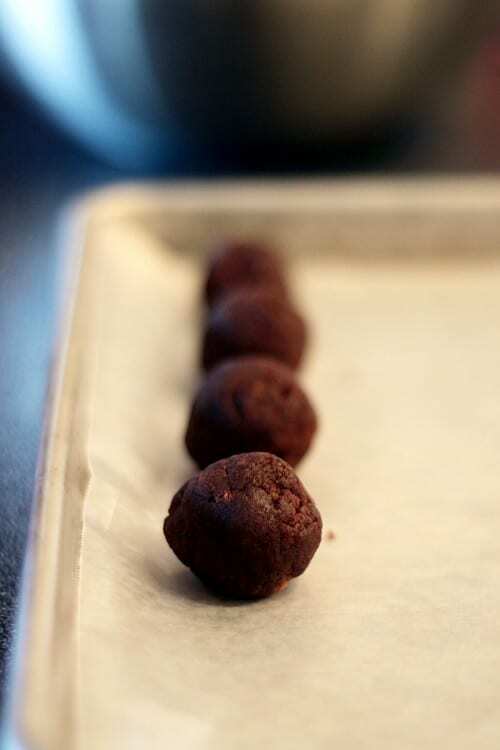 Maybe freeze the cake balls, and then dip in chocolate when ready to use.